Since its founding in 2010, Upland Software has been at the cutting edge of cloud enterprise solutions. And by any measure, Upland offers an impressive array of them. Tools for managing projects, workforces, and IT investments? Check. Automation software? Check. Applications for customer engagement, client development, and community-building? Check. Like all multifaceted companies in fast-moving industries, Upland prizes flexibility. It needs efficient, adaptable approaches for not only its operations, but also its workspace. That’s why they chose The iPad Receptionist. At Upland’s headquarters in Austin, office manager Ari Sacharow is pulled in many directions. “I’m basically a jack of all trades,” he says. He helps out in all departments, with duties ranging from administrative support to website maintenance. Until recently, Sacharow also played the role of full-time greeter at the office entrance. But it quickly became clear that he couldn’t be everywhere at once. He started researching solutions so he could be more mobile in the office. That’s when he found The iPad Receptionist. “The iPad Receptionist helps me a lot,” Sacharow says. “Instead of having to sit at the entranceway all the time waiting for somebody to come in, I have a lot more freedom. I’m no longer glued to my desk.” The iPad Receptionist also eliminated the need for Upland to bring in outside contractors or temps to fill Sacharow’s shoes when he’s gone. 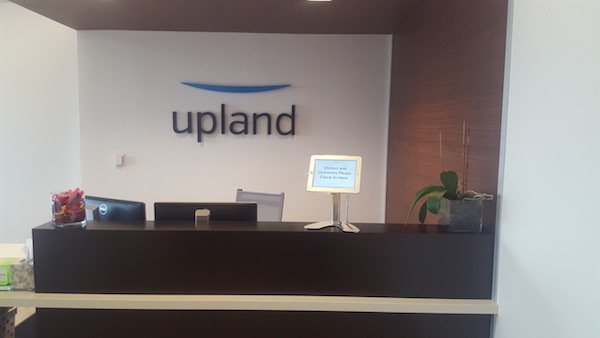 While the software can’t help with administrative support, it can ensure that all of Upland’s visitors are greeted promptly and in style, even when Sacharow is on vacation or taking a personal day. Sacharow particularly loves the newer, more customizable features of The iPad Receptionist, for example, the feature that allows them to include a photo as part of the interface “so employees know they’re greeting the right person.” Upland also participates in the IPR Beta Program to test features that are on the horizon for a wider launch. At the iPad Receptionist, we’re always happy to hear how our customers benefit from our product and our service. And we love hearing from them! Feedback from users like Sacharow helps us make the iPad Receptionist even better and more useful for all our customers. 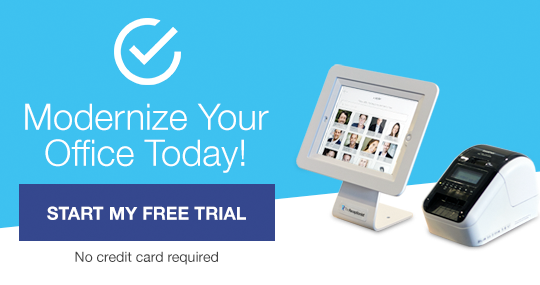 Do you have an iPad Receptionist story to share? Drop us a line! Upland Software (Nasdaq: UPLD) is a leading provider of cloud-based Enterprise Work Management software. Our family of applications enables users to manage their projects, professional workforce, and IT investments; automate document-intensive business processes; and effectively engage with their customers, prospects, and community via the web and mobile technologies. With more than 2,000 customers and over 235,000 users around the world, Upland Software solutions help customers run their operations smoothly, adapt to change quickly, and achieve better results every day. To learn more, visit www.uplandsoftware.com.